Jack and I would not allow this holiday to fly by without another fashionable photo shoot. With a little enticement from the "shake-shake-shake" of the Indian corn, Jack was game! 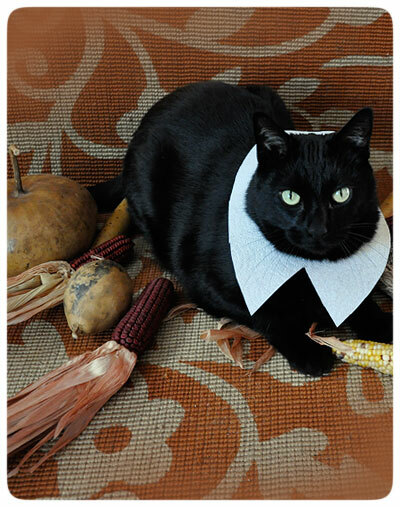 I tore off a square from a roll of paper towel and began trimming his pilgrim's collar... He sat by my side as he always does when I prepare his seasonal attire, and we had fun! Happy Thanksgiving to ALL from our family to yours...... I am so very thankful for your friendship and support, year after year!